TradingView Blog / Trading and Brokerage / Order ticket update for all brokers on TradingView! We are happy to announce that a redesigned order ticket is now available to all brokers on TradingView. If you have already used the new order ticket in a Paper Trading account then you shouldn’t be surprised. Functionality of the new order ticket is pretty much the same for all brokers (there could be minor differences that you might have noticed when working with the old order dialog box). 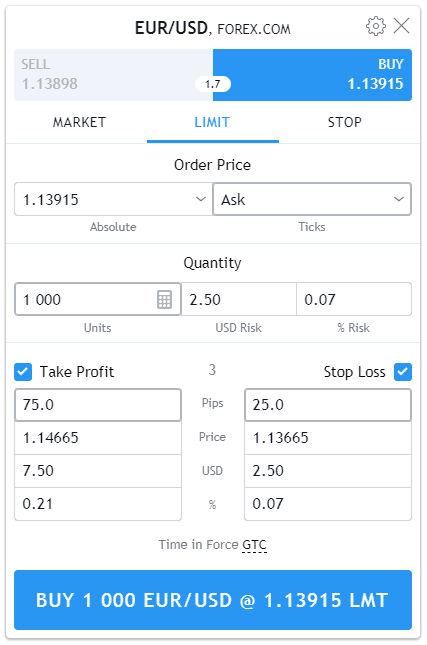 You may want to check out our older blog posts to learn more about the new order ticket: New Order Window Design and More Ways to Set Take-Profit & Stop-Loss Orders. Feel free to send your questions and suggestions directly from the order panel, the link is at the very bottom. Thanks and enjoy using TradingView!